Modern Glass Balcony from £396, made to order. Delivered to your door ready to be fitted. It is made from 10mm toughened glass, with 40 x 40mm box section galvanised steel and stainless steel clamps. Standard colours are anthracite grey, graphite silver, white or black. Or any colour of your choice for an extra £25 per balcony. Powder coating option £40 per balcony. We can supply the exact size you require, up to 7 metres wide (see this case study of a 6.3m mirage balcony). The maximum size using a single pane of glass is 5 metres. 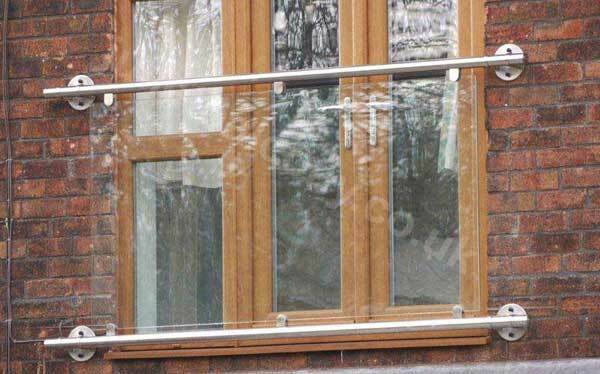 We don’t know of any other suppliers providing glass balconies in those sizes. The Mirage is also available as a small platform balcony, ideal for plants. Pricing is according to the width of the balcony and depth of the platform, starting at £150. Unlike most of our competitors, there are no other charges. All prices include VAT, fixtures and fittings, bolt covers, touch up paint, etc. All major cards accepted – no extra charge for credit card payments. Sand-blasted frosted/opaque privacy glass is available for an additional £25 per metre.